Connaught Education recently met the new Headmistress of Croydon High School: Emma Pattison. Croydon High is of London’s most well-respected girls’ schools and part of the prestigious Girls’ Day School Trust (GDST) network. This was our first visit to Croydon High and we were hugely impressed with the school’s beautiful grounds; it is spread over 20 acres and boasts some hugely impressive facilities. Sitting in Emma’s office looking out at the grounds, you certainly felt far away from the city (even though you are not) and I can see what a lovely place this would be to work and study. Connaught has recently sourced two teachers for Croydon High and this adds to the GDST client base we have which includes Putney High, Wimbledon High and Northwood College. The GDST network is synonymous in the independent school sector with the highest quality of girls’ education and for developing well-rounded, mature and confident young women. Croydon High is no different. Founded in 1874 in central Croydon, by Dorinda Neligan, an intelligent and assertive woman, the school treasures the story of one of Dorinda’s first excursions taking girls to their first prizegiving when she famously plucked ivy leaves from the school grounds for the girls to wear in their hair to help distinguish them as Croydon High girls. The ivy has been the school’s emblem ever since and, recently celebrating 50 years on its current, impressive site the school now has over 630 girls on roll across its junior and senior schools. The school boasts outstanding academic results with 94% of A Level grades in 2016 at A*-C and 86% of GCSE grades at A*-B whilst also providing a very strong extracurricular programme. Its latest ISI report was very flattering and had particular praise for the school’s academic achievement, the pupils’ personal and SMSC development, the quality of teaching and learning and the pastoral care given by staff. 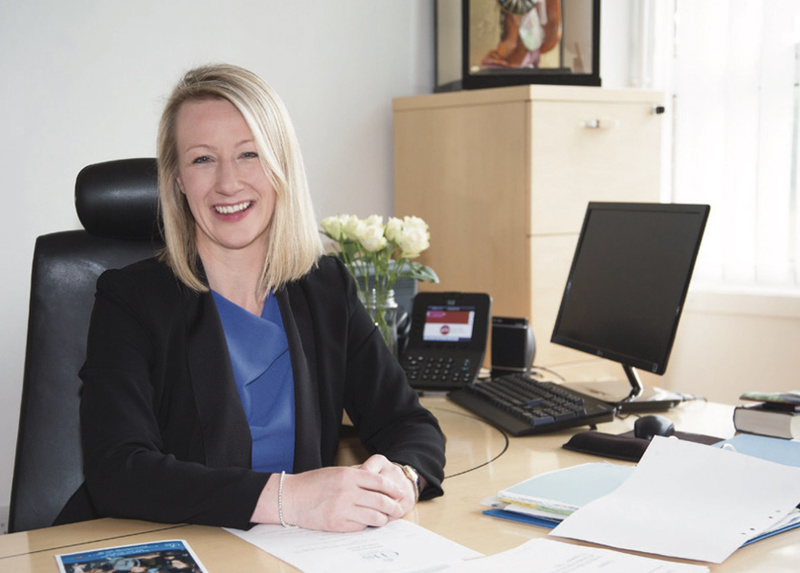 Emma Pattison joined Croydon High in September 2016 as Headmistress, replacing Debbie Leonard who was in post from 2010 and has since moved to the Grange School HMC in Cheshire. This is Emma’s first Headship and she was previously Deputy Head (Academic) at St John’s School HMC in Leatherhead from 2012-16. During her time at St John’s, she was responsible for developing the school’s academic standards, overseeing the UCAS programme and promoting better engagement among the school community. Emma comes from an MFL teaching background and previously taught at Guildford High School for Girls (where she was Head of MFL) and Caterham School (Head of Year 8). Emma is originally from Lincolnshire, trained at Warwick University and is a keen musician and singer. Michael: Congratulations on your first Headship post. You are now in your second term, what’s been the most enjoyable part of the job and what has been the most challenging? Emma: The most enjoyable part has definitely been working with the girls. Just last week, I met with all the Year 13s to discuss their routes for next year. It was so inspiring to see the choices they were making and the real diversity of the routes they are taking; challenging pre-conceptions of what and where girls study. We have one girl who has applied to do a degree in farming, it’s a reflection of the culture we have here. The most challenging part has been staffing. We look for the highest quality, most inspiring staff. Staff who can inspire the girls every day and champion girls’ education. Finding staff like that is not easy. Michael: What is your vision for Croydon High? Emma: Excellence across the board, in all areas. We have a very strong foundation here and are looking to build on it. An example of this is the approach we took to Holocaust Memorial Day recently. The project was embedded across a number of curriculum areas and was a very fine example of experiential and creative learning; we really took them on a journey and they responded with the most incredible artwork, website creations and creative written work. I also want to celebrate – even more – the significant talent our girls display. The recent school production of “The Wizard of Oz” was fantastic and performers from across the junior and senior school interpreted the roles with real comic style and imagination. The standard of production and performance was so high that many of parents have been in touch to say that it was like having a night at the theatre in London! Michael: What made you go into the teaching profession? Emma: Although I didn’t go straight into teaching after University (I did a graduate scheme with Thomas Cook) I think I always knew I would eventually. I went to a girls’ school myself and was a keen musician. Whenever I was with younger musicians and helping them learn, I got a real buzz out of getting them excited about performing and from then, I knew teaching was for me. I also taught English as a foreign language and really enjoyed that. Michael: When did you realise you wanted to become a Head Teacher? Emma: I was always very driven to go into senior management; it brings an interesting challenge and I love the variety of the day. It was when I became a Deputy Head that I realised I wanted to eventually become a Head. That’s not true for all Deputies; they are very different jobs. It’s an extremely rewarding job and the biggest learning curve for me has been learning the importance of being a role model for our girls. It’s a huge responsibility but one that I am proud to take very seriously. Michael: You’ve been in the profession for fifteen years. There are alarming statistics about the number of teachers leaving the profession within the first five years, what do you need to stay within the profession for so long? What would you say to any NQTs or trainees reading this? Emma: You simply have to love it. You have to love working with children and you have to love your subject. Every career has people leaving it to try something else, especially amongst young people just starting out. With teaching, the effects are very tangible as we are talking about children’s education and so these figures are very public. I can only imagine that if the profession is not right for you, that this must be an extremely difficult and lonely job. Michael: Would you say the teacher recruitment and retention crisis has worsened since you entered the profession? Emma: Perhaps. Teaching was hard work fifteen years ago and it’s hard work now but it’s just as enjoyable! Perhaps when I trained the routes into teaching were a little clearer and a little more affordable. The majority did a PGCE and some did GTP. Now it’s less clear and there are many more options. Michael: How do we get more people into the profession and keep them there? Emma: The routes into teaching could be simpler and better funded. I think we as a sector need to do more to encourage graduates and help them figure out if this is something they want to do. When I was training, it was very common to have graduates come in and try out teaching for a week or so. That help and mentoring is really important. Michael: What can specific schools do to attract the best talent? Emma: There are obvious factors such as salary. However, I think young people today look for more than that in the workplace. They are very ethical and I think culture is very important to them, as it should be. They want a school that is friendly and supportive of them. They need to understand why they are working so hard, to know what it’s all for. That guidance comes from more experienced colleagues. Michael: What do you look for in a teacher at Croydon High? Emma: They must put the girls first and look to really hit the mark with them in every lesson. They must love their subject and love working with the girls to inspire and support them. We look, of course, for great qualifications and experience, but there are many other factors. We must see ourselves being able to work alongside them. Michael: Are you alarmed that even some of the finest schools in the country, such as yours, can struggle to attract teachers in certain subjects? What can be done to combat this? Emma: Yes of course. I think you have to be open -minded. You have to look at a person and think “can I see this person as a successful teacher?” You can’t always expect the finished product to come to you. We recruit people from many backgrounds: career changers, graduates, internationally qualified and so on and we see it as a responsibility – and a privilege – to train and develop them. If the attitude, work ethic and innate talent is right, the rest will follow. Michael: What is the main thing you look for in an education recruitment company like Connaught? Emma: Quality. We cannot compromise on the quality of our staff and we are looking for quality candidates from you. Michael: Thank you very much for speaking with us and good luck.